In most businesses these are the key to happiness and success, and recently I was given an opportunity to tick at least two of these boxes! As a cake decorator it is inevitable that you get approached by companies to make orders that offer ‘exposure’, based on their profile and audience numbers. It is up to you as a business owner to decide whether you want to take that risk. Also, if you can afford the time, resources and materials in return. It is also worth keeping in mind the ‘Fame, Fortune or Fun’ motto. Please note, this can also be applied to day-to-day order enquires. Will the order bring you Fame? This might mean more brand exposure; attracting a larger online social media following or if you are fortunate enough, a TV appearance! Will it bring you Fortune? Is the brand willing to pay you your worth… in return for something bespoke or are they wanting a freebie? If the company or brand is something close to your heart you may be willing to do it for free in return for exposure or to get the chance to meet them and work with them! It could be that you have always dreamed of making a life size car made from cake and this is your opportunity to do so?! Whatever the reason, if it is ‘fun’ to you and you have the time, resources and materials then go for it. Recently I was approached via email, by no other than ITV’s – The Voice! As you can imagine an email headed from them was a pretty big deal for me. As a fan of the programme and the hosts of the show, particularly Will.i.am, it was a definite case of Fun (tick) and Fame (tick). 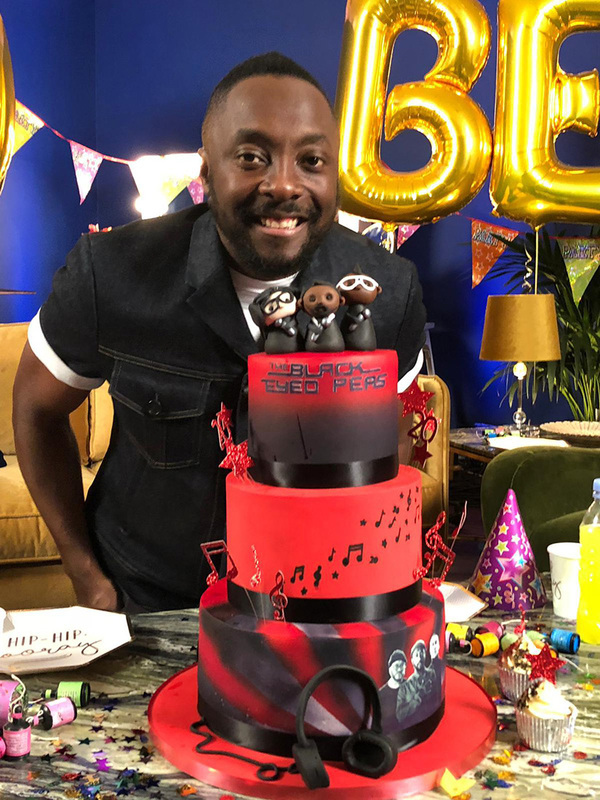 Having watched the Black Eyed Peas in concert, followed Will.i.am and his TV programmes and learning that 2019 celebrates their 20 year anniversary, I was more than thrilled to be asked to make the BEP anniversary cake that would potentially feature on The Voice. The brief was the cake needed to be large, feature the colours of the The Voice UK show, models of the BEP and be delivered to the studios at Media City in Salford where the auditions take place. All the images I took needed to be kept private until after the show aired. Design complete, signed off, the cake was delivered… but, I didn’t get to meet Will.i.am. However, he certainly met the cake! Here is the video from The Voice UK Instagram page featuring Will.i.am, Sir Tom Jones, Olly Murs and Jennifer Hudson. The video with the cake is fantastic and I was thrilled with the feature. Whether it actually brings more ‘Fame’? I guess you will have to watch this space… My dream would be to make a cake for P!NK. There are a lot of ‘opportunities’ that I turn down because they don’t tick any of these boxes or quite simply, they do not offer the exposure promised. My advice is to choose wisely, do your research and one day perhaps your idols may come knocking x.